An ardent collector of antiques, I was on the lookout for over two hundred-year-old petit point articles at antique stores in London. After we had made it in and out of two stores, a friend (who lives in London) was accompanying me enquired whether I was buying them for my girlfriend. “Collecting in order to gift your wife to be since I observe that you are least interested in getting her anything,” I remembered telling him wryly. His instant reaction with an impish smile (not getting my cynicism) was, “Are you crazy, dude! She’s supposed to bring along her stuff, man,” he paused, “and what’s more? She’ll get me all that I’ve ever wanted.” I stood there aghast. My cynicism fell pale before his scheming mind. He patted me on my shoulder and continued, “Spend on yourself, buddy, and let your wife and her family give you what you rightly deserve. That’s what wives are for, mate.” I was appalled to say the least when he was finished, and this coming from a man who drove a Lamborghini and hailed from five generations of wealth. Incapable of saying anything to him, I pondered about why it was that very important for those who have everything to want more? I mean to want is a basic human need, it almost seems like an ingrained characteristic of man, but what then makes us want to want more when we are born with silver, gold and platinum spoons. Why this filthy desire for hoarding? Are we so dispossessed of our own self-worth that we would like to derive pleasure in seeking and obtaining from the woman, (who is supposed to be our partner in life), and not somebody we marry in order for them to provide us with a surplus of our material needs? Clearly bewildered, I needed to divert my mind from the nonsense that my friend had spoken. I explored my external hard drive to see if there were any unwatched movies. Getting myself a dram of liquid sunshine, I gave myself up to the luxury of my leather sofa as Daawat-e-Ishq was on the menu for the night. I understand that any of us raising an objection would make no difference, because the ways of the world are far more deeply entrenched in wanting to follow customs and traditions, and certain customs and traditions indicate that if the man is not given sufficient dowry, (in accordance with his vanity) he then stands to lose his rank in society and that is something no man will take: an indirect injury to his ego. For me, such customs and traditions seem demented, and need most urgently to be swept away into the dustpan, the irony being that what has been a norm for centuries cannot be dampened or eradicated by voices being raised against it, not your voice, and not mine. People would watch cinema and cry a bucket, but once they are finished sympathising with the characters, they are back to square one. At times such as these I feel that the animal kingdom is far better – at least they possess respect for their partners in comparison to the human race who shamelessly asks for extra when they already have more than enough. So can something actually be done about this? I would like to think sanguinely, but I feel nothing could be really done because human psyche is such that if what is being said is not in conjunction with their beliefs, then one tends to divorce every logical thought and prefers to play ignorant. While genuine ignorance can be in a manner advantageous, considering that it is prone to be complemented by humility, inquisitiveness and open mindedness, ignorance that stems out of knowing what it is doing, and yet playing ignorant is as criminal as the killer killing and then pleading selective amnesia. Such people coat their minds with a waterproof varnish and would resist newness taking birth, and let their pin-holed views thrive in their minds simply because that is what they are comfortable with and unashamed about. That is the saddest part of modern life, instead of shunning stupidity, our society is regrettably engaged in polishing and decorating the cage in which man is keeping alive the illogical thoughts of his elders by adhering to them when he must muster up the courage and free himself from such an imprisonment. But then again, would man be willing to shun such concepts is the bigger question. Honesty, trust, adjustment and love are some of the main prerequisites of a good marriage. 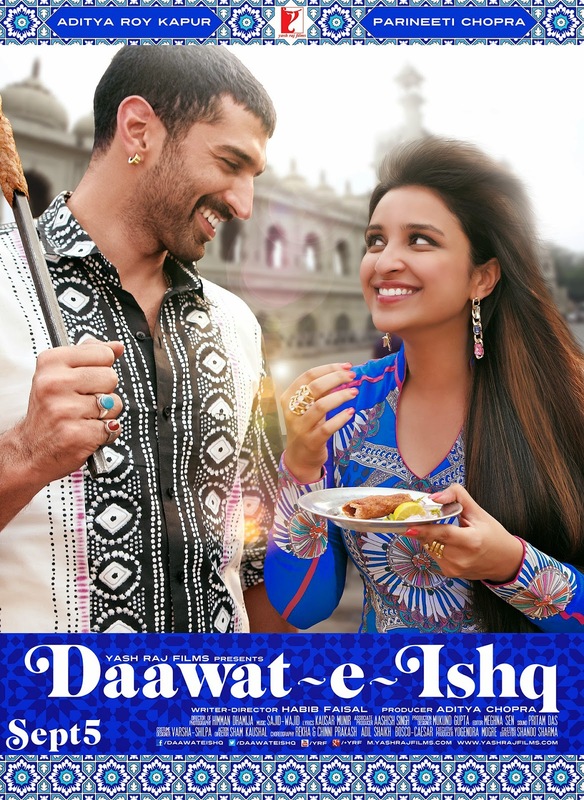 Petty differences seem little in comparison to the above, and that is the foundation of Daawat-e-Ishq – a remarkable entertainer with a mix of everything, from the food on the streets, to the mannerisms of people at workplaces. The dialogues are simple but incredibly effective. The attention to certain specifics is commendable, for example how Aditya Roy Kapur as Tariq “Taru” Haider cleans the seat of his Impala when Parineeti’s father Abdul Qadir played by Anupam Kher brushes the soles of his shoes while plonking himself on the back seat. I like the way Tariq Haider is this manly man, yet sensitive about the trials and tribulations a single father would have faced while having raised a girl child after the death of her mother. I like how Tariq Haider apologises when he crashes into the couple while rushing after Parineeti Chopra (Gulrez “Gullu” Qadir) at the railway station. That is basic manners that we have forgotten. I liked how Gulrez Qadir sets out to deceive the man, but conscience catches up with her and she embarks on a voyage to amend her follies despite being aware that in doing so she might lose the man she has hurt, the very man who loved her from the deepest echelons of his heart. With such simplicity the circumstances compel her to cling to her plan when her heart and mind keep constantly reminding her that she is on the wrong. That is what happens more often than not in life too – we find ourselves apprehended in the quagmire of time and to retrace then becomes a liability than a luxury. 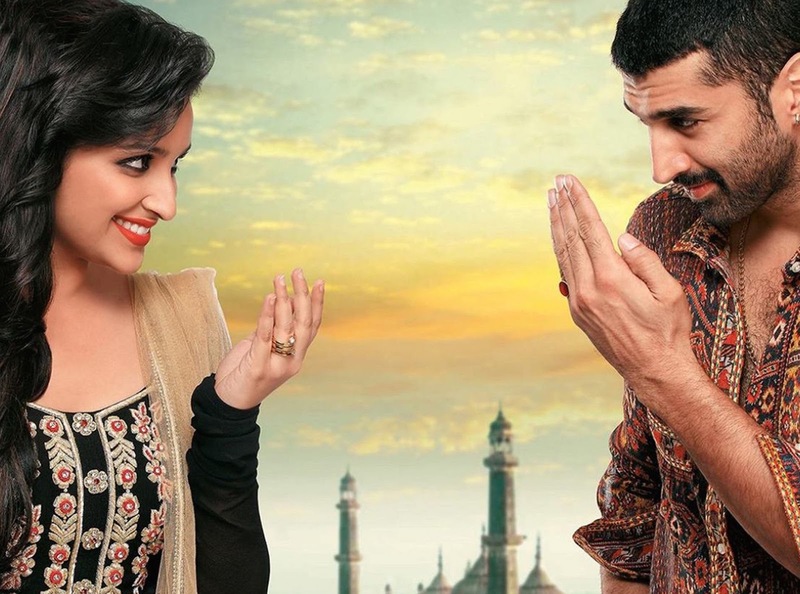 Daawat-e-Ishq does not have the potential of being magnificent, but it manages to sustain your attention without dipping anywhere. Dowry is a touchy topic that has been represented rather grimly, and with maximum melodrama in many motion pictures earlier, but Habib Faisal, both as a writer and director, has sprinkled this one with humour, as he is prudent enough to understand that humour seldom fails. The film has multiple layers that are so cleverly contrasted without them coming across as being in your face. I loved how Tariq Haider has been portrayed with such dynamism and uprightness. I take a bow before Habib Faisal to have highlighted on some rather crucial details as well. First, the young man Tariq Haider has failed in his twelfth grade, and he is unashamedly candid about it. Second, he disapproves vehemently that his parents’ had lied about it on his online profile and comes clean before the woman who had invaded his heart. Third, he is not proficient in English, but he is a successful restaurant owner who charms Indians and foreigners alike. An entrepreneur who studies the pulse of his people and moulds himself around it. I adore how his character breaks all the clichés about the notion that only the qualified are educated, because street smartness and formal qualification have nothing much in common. It is a proven fact that those who are highly qualified are not as successful as the ones who are average. Qualification does provide one a process, but process is not everything, intuition is everything, and that comes with an extensive education that one gathers through experiences in one’s life. Fourth, he wears the tackiest clothes caring two hoots to the world’s estimation of him only going on to reaffirm the notion that one can wear the most expensive clothes, but if one does not hold a natural flair for finesse, with an appropriate attitude to match and a heart of gold, there hardly remains a difference between saffron and sawdust. Parineeti as Gulrez “Gullu” Qadir is wonderful. We all know she is not a drop-dead diva, or a bewitching beauty, and even then we all know that she has a sense of sparkle to her. I enjoyed the father, daughter relationship. It has equal measures of respect, friendliness and steadiness to it. If only all fathers displayed such sensitivity and understanding to their daughters it would do wonders to the world. Her character has been etched with such positivism that if it could only inspire women to uphold their respect and not lay it down like a carpet for a man or his family to walk on, it would once again do wonders to the psyche of women. What had me under Parineeti’s spell was her Hyderabadi phraseology. It is unbelievably precise. Although I admired her ability to pick up the mechanics of the language, I could not, however, relate to such an intonation considering that the Urdu we speak down south is a mix of Lucknowi Urdu that has a distinctive delicacy or smoothness to it and this drawl gets slightly jarring after a while, but the characterisation warranted such a treatment, and she has done immense justice to her role. Adi is Adi. 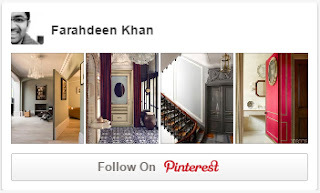 He is what one calls customised design from scratch born in times of cut, copy, paste templates, and that is why he is finding it hard to find a foothold in the mainstream. The mainstream thrives on histrionics, and Adi is not made for such melodrama – he is an aristocrat, a picture-perfect thoroughbred. He can carry off with sublimity a lover consumed with giving up his own life for the sake of his love in Aashiqui 2, just as much as he can be the niftiest friend in Yeh Jawaani Hai Deewani, and despite all that, he can enact the ‘Myself Big Boss Haidari Kebab’ with a supreme, almost majestic ease. I have not had the opportunity of hobnobbing with people from those factions of society, but they say that real culture thrives in the cities in such environments. Besides, Adi and I happen to hail from similar lives, and our sheltered lives would not give us the opportunity, or the frequency so to say, to be surrounded by people like Tariq Haider most of the time, and yet, he so seamlessly holds himself together (as I pointed out before) in the role of Tariq Haider as he brings to it a certain meaning of style and depth that one would not necessarily associate with someone from that strata. Does competition trouble him? Not really, considering how impervious he is to such emotional hypochondria. And why would I say so? I say so simply because Adi neither has the time nor the temperament to wallow in such sanctimony. And how am I this sure about this? Let us just say I know, and more importantly, being the most successful actor in his genre has left Adi inoculated from the virus of artistic exasperation. That precisely is the dexterity of Adi. The music by Sajid Wajid is lukewarm. Other than the songs Mannat rendered soulfully in the versatile voice of Sonu Nigam, and the title song Daawat-e-Ishq in the melodic vocals of Javed Ali who sang Kaise Kahein Alvida, my all time favourite from Yeh Saali Zindagi made by my friend Sudhir Mishra and picturised on the Audrey Hepburn of India, Aditi Rao Hydari, the rest of the compositions are worthy of nothing but a toss at the wastebasket. The costumes were dreadful. The cinematography was awful. The homes, the hotels, the streets, and nearly all the other locations were rotten. Perhaps a bit more attention on these disciplines could have made it better in approach and reflection. To sign off I would say that society is composed of two great classes — those who have more dinners than appetite, and those who have more appetite than dinners, and I would like to ask that when we claim we have advanced as a race, and that in the twenty-first century we would like to free ourselves of old-fashioned prejudices, why do we not seem to have budged an inch from our restricted stances? Why do we discrete between castes, sexuality, and colour even today? We feel pleased that we are living a life of quality and superiority. We feel that advancement and access to information has left us no longer ignorant, but who is the actual ignorant in the end? And who is actually fooling whom? I don’t quite know the answer to that. Do you?